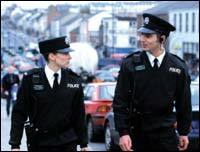 Almost 1,000 Polish people applied to join the Police Service of Northern Ireland in its latest recruitment drive. The police have confirmed that 968 of a total of more than 7,700 applications last November were from Poles - more than 12%. Police said that the recruitment process was ongoing. Meanwhile, a Polish police officer is expected to join the PSNI on secondment at the end of this month. There are currently no PSNI officers from Poland, although there are officers from Brazil, Canada, Germany, Iran, South Africa, France and New Zealand. More than 30,000 Polish people are currently believed to be living in Northern Ireland. A further 150,000 live in the Republic. It is estimated that between one and three million people have left Poland for western Europe since 2004. Poland has one of the highest unemployment rates in the European Union: 15.7%. The starting salary for PSNI officers - about £22,000 - is thought to be about four times that which an officer would be paid in Poland.